the last day of school, and both boys were invited to play at a friend's house until 8:00 p.m. Faced with such a giant block of time without children (perhaps the last time until September), I made the most of it, roaming the aisles of my favorite bookstore, picking up lovely stationery to write thank you letters to their teachers, and meeting up with my husband for dinner at Lucille's, which we only do about once a year because it's just so darn expensive. At dinner, I was casually chatting with Michael about my plans for the half-day of school tomorrow (to see which teacher needs more help before the hounds are released for the summer at 11:30 a.m.) and completely out of nowhere I burst into loud, long, heart wrenching tears. Tears do not go with tri-tip BBQ dinners! But the more I tried to stop crying, the more relentless the sobs became. This has been a long year. A difficult, challenging year. It felt a lot like we were on a very steep slide lined with sand paper. The potential for fun and frivolity was there, but there was always a bit of chaffing. We've come such a long way since September when the boys marched off with shiny new back-packs and lunch pails and shoes and hair cuts, brimming with optimism and confidence. We had huge plans for this school year. Major plans, exciting plans. The kind of plans that kept us up at night, giddy and dizzy at the dazzling path stretching out in front of us. And then with a loud and stunning, whoosh, everything changed. Plans? Ha! Absolutely nothing went as we'd prepared or hoped. We did not move to Macau, China, despite being packed up and ready to go, new home in place, boys enrolled in their new school with uniforms purchased. Even worse than simply not moving, Michael lost his job and the entire project was shelved. Financial plans for our future had to be completely scrapped. Heck, even simple financial security had to be scrapped! Those were the biggies. There were a dozen smaller things that happened that brought bitter disappointment and major life changes we are still adjusting to. Friendships we believed were deep and lasting abruptly ended, leaving gaping, open wounds. Long-held dreams died. Goals had to be radically shifted. The pain of loss made its shadowy way into our life, reminding us that what is here today might be gone tomorrow. We pulled together tight, close, unbreakable and weathered through as a little family unit. We made a point of only investing ourselves in the top priority of providing a stable foundation for these beautiful boys of ours, while still trying to push them toward independence. It wasn't all bad, but it was all exceedingly difficult. Sitting there in Lucille's, wiping tears away with a cloth napkin was the acknowledgement that we now end this part of our life, never to get it back. For better or for worse, this school year with all its headaches and challenges, small victories and major setbacks is now over. A fresh start awaits us as a long summer vacation presents itself, full of possibility. Fall will arrive and we'll start again with new teachers, new backpacks, new haircuts and shoes. We'll march down the sidewalk in September, full of optimism and confidence once again, with hope springing up and wisdom born of experience dripping down. And, knowing me, there is no doubt I'll be crying that day, too. It happens. 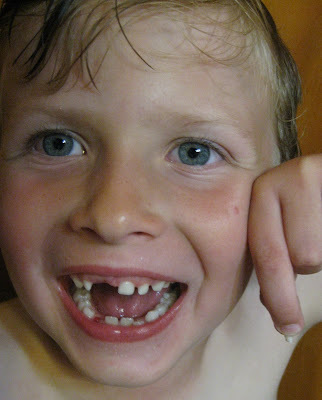 Now excuse me, I need to alert the tooth fairy to the fact she must make a stop at our house tonight, as a certain almost-six-year-old pulled out wiggly tooth number four all on his own. Hey now, look at me, I'm not even crying!